Durant doesn’t want to get in the way of his team’s playoff hopes. Kevin Durant has been playing with a chip on his shoulder this year. It’s surprising considering Durant doesn’t have all that much to prove. He’s won two NBA titles and two Finals MVP’s, but he still seems to feel like he needs to show the world something. This mentality has led to Durant being ejected numerous times while receiving a plethora of technical fouls. 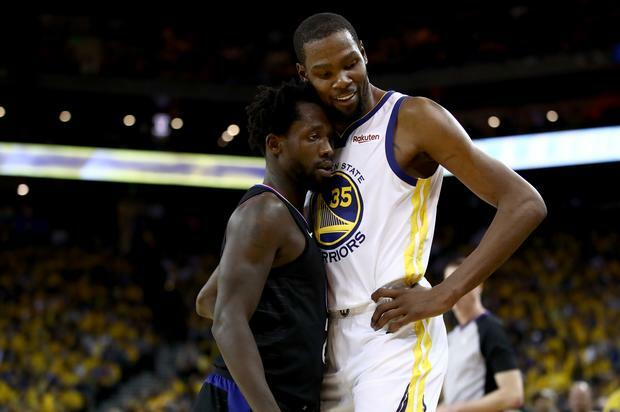 Durant was ejected once again, this time in the Golden State Warriors first playoff game against the Los Angeles Clippers on Saturday. Despite the team winning easily, Durant spoke about the incident today, saying he doesn’t want to be a distraction. Durant and Patrick Beverley were both ejected after going at it on both sides of the ball all game. Beverley continuously mocked Durant for flopping and then eventually the two almost came to punches. That’s when the referee got in the way and threw them both out. The Warriors will take on the Clippers in game two on Monday at 10:30 P.M. EST.